'Stepping Into The Fire' is a documentary film that tells the story of a seemingly successful man living an unfulfilled life and his journey towards truth and happiness. What if the thoughts, values and philosophies that guided our lives were at the root of our misery and there was ancient and time honored knowledge that could truly heal our soul. This compelling film provides insight into ancient shamanic practices from deep in the Peruvian jungles, and a thought provoking commentary on human spirituality and wellness. 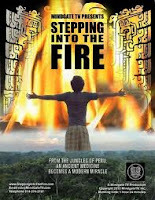 Stepping Into the Fire is the cinematic release that reaches into the ash of the bare bones of existence and asks the question “is humanity born to die, or is humanity born to live?” The film follows the true story of three successful individuals brought together by an ancestral medicine from South America that has become legendary for its miraculous and profound effects. Ayahuasca – as the Amazonian brew is known – is well known for its mental, physical and energetic healing properties. Stepping Into the Fire closely examines the life-changing effects Ayahuasca can have and illustrates why environment and health are so crucial to human success on a global scale. Stepping Into the Fire features Roberto Velez, Donna Walsh, Bo and José Pineda Varges (a.k.a Maestro Mancoluto). The story begins with Roberto Velez – a high-level New York Stock Exchange trader – raised since adolescence in America, but ultimately of Peruvian descent. In the peak of his career, Velez finds himself seeking; unable to reconcile his material gains with the lack of direction and depth in his life. With nowhere else to turn, Velez scours Peru – the land of his ancestors – only to find Mancoluto, a first-level master shaman descended from one of the earliest civilizations in Amerindian history, Chavin. Mancoluto’s expertise in natural health, particularly in the case of two ancestral medicines known as Ayahuasca and Huachuma, provides him a unique lens when treating Velez’s predicament. Once this connection was made, countless other pieces start falling into place and a center for ancient Peruvian healing arts is quickly born. Stepping Into the Fire is the beautifully woven tapestry of recent events that will leave you ignited and inspired to discover what it is in your life that keeps the fire alive.